What's For Lunch Honey? : Butter Oil! What the heck is it? Butter Oil! What the heck is it? My last post "the best Caponata Sandwiches ever" raised a few questions about the type of oil I used. It was a delicious butter oil, which I got, along with the raspberry balsamic vinegar, from a dear friend for my birthday. I was surprised that so many of you were unsure what butter oil is, but as I researched it I realized that it is an insider's tip and it's popularity has only just started in Europe. So, what is butter oil? Butter oil is a wonderful delicate oil made of canola, however by no means to be mistaken for the canola oil one buys in a supermarket. Butter oil is only available in a few delicatessen stores or can be bought online here in Germany. This oil was primarily developed for clinics and the gastronomy and has no cholesterol. Furthermore, it does not have such a large quotient of saturated fats like butter, in fact butter oil has over 60% unsaturated fats and 10% omega-3 fats, making it extremely healthy. You can pretty much replace all the oils and fats in your kitchen with this oil. One can use it to bake, roast, for salads or even on bread instead of butter or margarine. You can clearly smell and taste the buttery aroma. The oil is produced by adding a synthetic blend of naturally identical flavoring substances. Of course, one can simply enjoy the healthy advantages of the inexpensive canola oil, which is available as a refined, neutral tasting and authentic cooking oil in every supermarket. However, for an exquisite butter aroma to top your elegant dishes or for health purposes, butter oil is unbeatable. Note: The difference between the North American and European canola is, that the European canola is not genetically modified. The European Union has banned the importation of genetically manipulated crops like canola, and it has not adopted the new name "canola" to be used for rapeseed oils. I was unable to find much reference to butter oil or refined canola oil in the US. My research was mostly done through websites and documents in the library I found in German. So, I am leaving this as an open post. If anyone has reference or knows where to find butter oil in your home country, or simply has more information on it, leave your comments in the comments section of this post. Wow, I'm sure out of this loop. Very interesting. Can wait to see what comments may come up with on this one. Very informative post, Meeta. I'm looking forward to learning more about this. Very, very interesting. I will keep my eye open for it. Thats new to me, and it looks good. Will sure try it if I happen to come to acroos it anytime. Butter...oil?? That sounds evil good! Hi Meeta. Hope you remember me. Its been more than an yr, and now i am getting back to my writing. The sandwich looks sooo yummy !!! N Butter oil is something i dint know was around ! Havent seen it in stores though. I hope to visit your blog often now, for ur always yummy recipies. Thanks for the research and thesis :) Will look out for it here, maybe Spinneys will have some. Meeta, I was quite curious myself, as I had not heard of it before. I googled with this term in English and in German. There were a couple of good links worth looking. 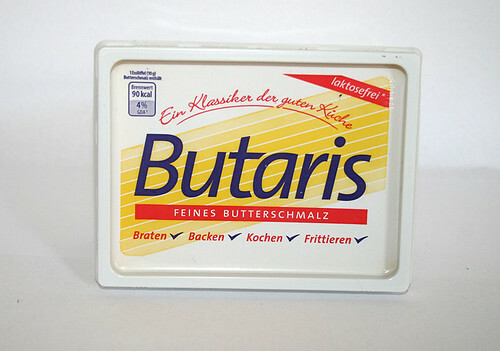 In English, like in German as well, the term is used in the food industry for nothing but the butter fat without the non-fat residues and water present in butter. Sounds similar to Indian "ghee". But, I also found the description given by you in the German sources. It "appears" to me that the term is comparitively new and is more a commercially used term by the retailers. That is what I found through google. But, I would think, not many of the Indian bloggers in Germany. thank you so much for your feedback. i do hope we can find more information about this - because if anyone does get their hands on it - well you'll be pleasantly surprised! PG! thank you so much for your lovely feedback! www.arlafoods.com are a Swedish Comapany who claim to be the first to sell butter oil and rapeseed oil, so it seems to be a mixture of ghee and canola, giving the low cholesterol characteristics of rapeseed and the lovely buttery flavour of butter. I wonder if I can get it here in England?? Oh goody, more researching! I really like your blog Meeta! Meeta, my query is in relation to transfats. We have gone off using butter substitutes and we use only butter and natural, less processed products like olive oil. I know that when canola is used in butter substitutes they have to do strange things to the canola so that it will solidify. I believe that transfats are outlawed in New York restaurants. So what, do you know, is the story re this canola product in relation to what is known of transfats? Why not just melt butter? and use that? It's more healthy than canola anyway, as long as it comes from clean grass-fed cows. I am doing my best to answer your comments but as there is not much information I am hoping you will help me here! Toffeeapple, were you able to find anything similar. yes arla were the first to find this. as a matter of fact the trend comes from there. Miss Eagle, i am not sure. i need to really find more information on this. aloudallowed - because butter oil does not have the huge amount of saturated fats butter does and contains a lot more of the omega-3 fats. i am not sure how many people pay attention that their butter comes from clean grass-fed cows. but please do not get me wrong - i am not saying that you should give up butter entirely i am saying that here is a new product that could substitute butter. No this is not what I was referring too. Rama is not really an oil it is more like a creamier version of butter in a bottle! Butter oil is really an oil with all the aromas of butter and a lot healthier! i looked on the back of a starbucks java chip frappuccino ice cream and saw " butter oil" and thought what is this? thanks for the info! Butter oil is not canola. it is made from grass-fed, dairy cows. I have to agree that butter oil is ghee, not canola oil. If one wants to use European (hopefully, not GMO as you pointed out) canola oil then call it that. Weston A. Price did a lot of research on oils and how much our bodies need them. Fish liver oil combined with REAL butter oil (from grass fed cows, esp in the summer b/c of the high K2 content from fast growing grasses (also buying the butter raw or low temp pasteurized is best b/c high pasteurization destroys the benefits) is better than any drug one can buy for any illness. Ghee can also be used in cooking and on other foods as well. Do not fear butter - only its substitutes. Real, raw, grass fed butter and butter products are far healthier than any vegetable oil.